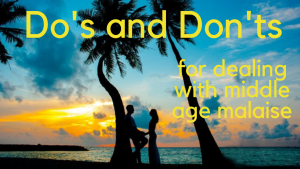 Do’s and Don’ts for the Middle Years and Beyond: Don’t be a complainer. Don’t neglect each other. Don’t deceive or lie. Don’t put excessive energy into your past or future and instead, live in the present – that’s all we’ve got. Do make your home a sanctuary, speak kindly to each other, bring pleasure to your partner, cultivate a proper temper and feed the heart. 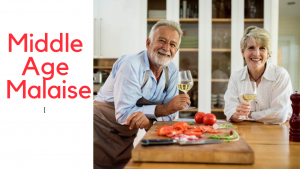 Middle Age Malaise doesn’t have to creep into your marriage if you know what to look for and how to address important areas of your relationship. What are crucial things to look for? 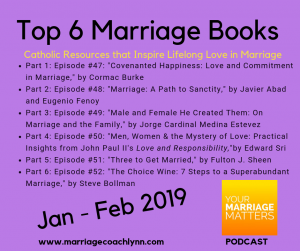 Boredom, neglecting the concept of LOVE MAPS – or sharing your inner world with your spouse, the importance of having a passion and shared goals. 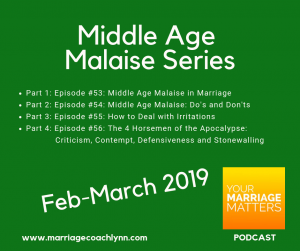 Today’s episode is the first in a 4-part series on the Middle Years of Marriage. 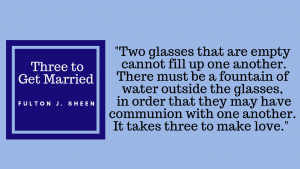 In “Three to Get Married,” Fulton Sheen addresses the longings in our hearts, the imperfections of relationships, the relationship between man and God, and husband and wife. 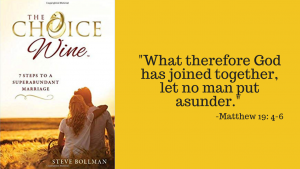 As you might have guessed in the title, it takes a husband, wife, and God to make a marriage profound and meaningful.